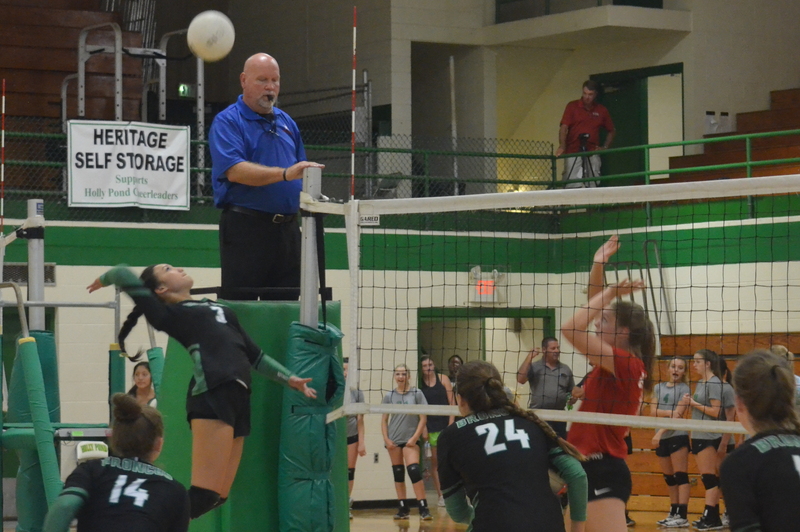 HOLLY POND – In a marathon match that took all five sets to settle, the Holly Pond Lady Broncos fought off a comeback from the Vinemont Lady Eagles to pick up their first area win of the early season Tuesday. The first set was the most one-sided of the day as the Lady Broncos got out to a fast start with a 25-17 win. Tess Duke led the way for Holly Pond in the scoring department, racking up six kills including the game winner. Sydney Dunkin had an impressive first set as well, collecting an ace, a block and three kills. The second set went Holly Pond’s way, too. Duke added four more kills to go along with two aces while Kara Hollis posted three kills of her own in the 25-19 victory. Rachel Hall had a big set for the Lady Eagles on the other side of the court, collecting three blocks and four kills in the loss. The third set is when the Lady Eagles started to shift the momentum. Vinemont got out to a big lead thanks in large part to three aces and two more kills from Bethany Golden as well as two more kills and blocks from Hall. Despite being down 18-10 at one point in the set, the Lady Broncos managed to chip away at the lead but still fell short, 25-21. The fourth set was another tightly fought contest that the Lady Eagles won to stay alive and force a fifth. Madison Oliver scored five kills in the 25-22 win while Golden added another three kills to her afternoon. On the other side of the net, Duke posted another five kills and two blocks while Dunkin picked up four blocks and two aces. Holly Pond was finally able to pull away in the fifth set, 15-10, thanks to two big aces from Hollis and two more kills from Duke. Lady Broncos Head Coach Emily Brown was pleased for the most part with how her squad performed in the win, especially compared to the last time they faced the Lady Eagles. Brown is optimistic that the Lady Broncos will be able to build off this win going forward and hopefully get hot at the right time. The Lady Broncos will be back in action at Fairview on Thursday for a tri-match with the Lady Aggies and Priceville. Vinemont will have a little time off before its next matchup at East Lawrence on Sept. 25.